A thriller that easily abandons any sense of gritty realism and rolls over to die on the meek hill of Hollywood excess. Harrison Ford brings Tom Clancy's hero Jack Ryan back to the screen, and he is surrounded by no shortage of talent including Anne Archer, James Earl Jones, Samuel L. Jackson and Richard Harris. But Patriot Games is too eager to pile on the fake threat by villains in the shape of an Irish Republican Army (IRA) splinter group. The bad guys combine the worst excess of incredible, inexplicable resources attached to stunning incompetence and lack of discipline when it matters most. Retired CIA analyst Jack Ryan (Ford) is in London to give a speech when he foils an attempted assassination of a member of the Royal Family by Irish terrorists. The terrorist hit-squad includes brothers Patrick and Sean Miller; Ryan kills Patrick, and Sean Miller (Sean Bean) is captured but traumatized by his young brother's death and vows revenge. The terrorist group is led by Kevin O'Donnell (Patrick Bergin) whose methods are too extreme even for the IRA. O'Donnell and his men violently free Miller during his transfer to prison, and are soon distracted from their homeland mission: they head to the US to take pot-shots at Ryan, his wife Cathy (Anne Archer) and young daughter Sally. With his family threatened, Ryan rejoins the CIA to help bring down the terrorists, who take refuge at a training camp in the North African desert -- but only temporarily. O'Donnell, Miller and their crew are soon back on US soil, mounting a most ridiculous full frontal commando assault on Ryan's home. Patriot Games collapses early and often by abandoning all links to reality in a film that demands some semblance of authenticity. The ease with which the terrorists criss-cross the Atlantic is laughable. The abandonment of their struggle to pursue a distraction in eliminating Ryan is ridiculous. The spectacular resources they bring to the battle to free Sean Miller en-route to prison are impressive but absurd. The British security arrangements and responses to terrorism are breathtaking in their ineptitude. Worse of all, the sudden incompetence of the terrorists at critical moments, in being unable to complete the opening assassination or achieve any of their targets at Ryan's house, just amplifies the farcical nature of the script. In both instances director Phillip Noyce effectively freezes time to allow Ryan's heroic intervention. 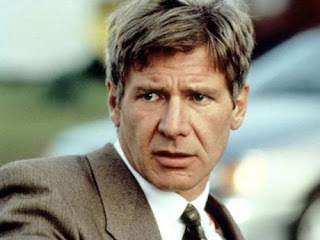 Along with Harrison Ford and Anne Archer, a strong supporting cast barely saves Patriot Games from fully-baked turkey status. James Earl Jones is head of the CIA; Samuel L. Jackson a military training officer; Richard Harris an IRA fundraiser in the US; all are nearly wasted as Patriot Games lurches from one ludicrous moment to the next. Rarely have so many stars been so badly let-down by so much nonsense.